LCBO's annual GoLocal campaign is in full swing, and I was surprised, and quite pleased, to see some newcomers and fresh rebranding in the shop's latest flyer. When and where had all these intriguing wineries popped up? 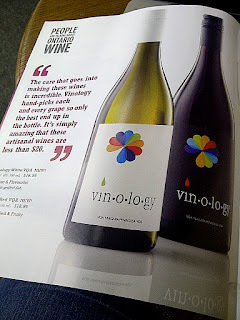 Vinology? O'Leary? G.Marquis? More importantly, have I been living under the proverbial rock and missing all the fun? On the digital side of things, the LCBO embraced social media with its Twitter-fuelled promo site. Wineaux are weighing in with tweets about awesome Ontario wines: chefs tweeting about VQA-paired menus, photos of winemakers hoisting their glasses in a friendly salute, writers and critics describing their favourites. Even the Premier posted a video to praise our award-winning provincial refreshments. Setting the "Ooooooo! Shiny!" factor aside, I put on my critical analysis hat and picked up a bottle of the Vinology White, a non-vintage blend of chardonnay, riesling, viognier and pinot noir. It's touted as "eminently quaffable" (a frequently spotted term that I'm still trying to understand) but I found it did far more than serve as a mere quaff. It had a wild, seductive nose and a mouthful of tropical fruit that kept on going. Medium bodied, could go either as a solo sipper or a supper pairing. Between this campaign, summer travels in wine country and a fun night out with the folks at Hobbs & Co Wine Merchants, I've been celebrating our local talent with gusto. There's plenty of it out there to be had, so you don't have to wait until the LCBO says it's cool to go buy Ontario wines. Do it now. Cave Spring Dolomite - Floral aromas with plentiful bubbles to tickle the nose. Tart Granny Smith apple dominates in the mouth, cranking up the acidity in equal proportions with the fizz. Foreign Affair 2009 Riesling - A little puff of petrol and oodles of fresh pineapple on first approach. Tropical fruit wrapped up in a full, well-rounded and smooth mouthfeel with just the right bit of zip. Like most of their wines, this one was done appassimento style (drying grapes before pressing.) I am seeing more and more European winemaking styles and varietal selections popping up here and in the States ... and I'm loving it. Good Earth Wine Company 2009 Chardonnay - This one napped in French oak barrels for roughly a year, imparting a subtle woody flavour in the midst of the creamy apple-pie-spice and caramel-popcorn profile. Soft, pleasant finish. Hernder Estate 2002 Meritage - Tawny port-coloured with a cigar-box/leather nose, soft but carefully structured tannins, holding its own just fine after a decade, proving that Ontario wines have what it takes to age gracefully. Creekside 'Undercurrent' 2007 Malbec/Syrah - Every so often Creekside sets certain plots of vines aside to "tinker with". This red blend is the result of one such tinkering. Muted berry with a hushed, cushy feel to it, the fruit becomes more prominent towards the finish, which is supported by round tannins.